Poster for Godzilla Vs. Megalon, a Toho kaiju crossover from 1973. It didn’t take long after the release of Godzilla in 1954 for Japanese film studio Toho to realize that the only thing more exciting than watching a guy in a rubber suit stomp around is watching two (or more!) guys in rubber suits shove each other. 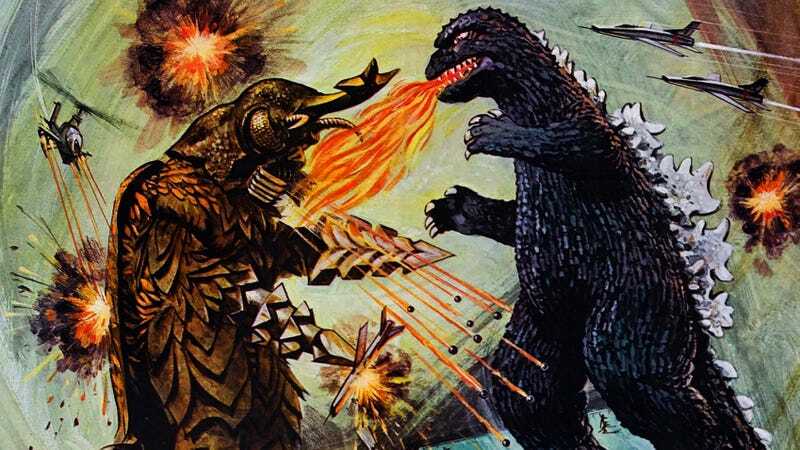 Two Toho monsters met on screen for the first time in 1955's Godzilla Raids Again—only the second film in the series—and by the late ‘60s, the studio was doing full-on crossover events like Destroy All Monsters (1968), which brought together nearly a dozen monsters introduced in previous Toho films. The kaiju battles and/or team-ups continued at Toho through the loopy Godzilla: Final Wars (2004), at which point the studio put its giant monster movies on hiatus. But times change, and now the Marvel Cinematic Universe and its relatively puny heroes are the global standard for crossover events and cinematic shared universes. And Toho is responding, saying that not only did the new Godzilla introduced in Shin Godzilla (2016) dwarf the pathetic, soft-bellied Godzilla in Gareth Edwards’ 2014 American reboot, but that the Toho monster universe is on the upswing once again, and will grind whatever sad excuse for a cinematic universe Legendary can come up with into dust like so many balsa-wood skyscrapers. After 2021, we’re thinking of a potential strategy that [releases] Godzilla movies uninterrupted at a rate of every 2 years, although there is a preference for a yearly pace as well. The future of the series and its forwarding developments are very conscious of the method of “shared universe.” Godzilla, Mothra, King Ghidorah, etc. could all share a single world view, much like a Marvel movie where Iron Man and the Hulk can cross over with each other. It does have a nice ring to it. Who knows, maybe if the box-office returns are right, they’ll even bring back Mechagodzilla.